The immigration authorities in Canada have conducted a rare Express Entry draw that is program-specific. It aims to attract Skilled Trades and Provincial Nomination candidates. A special feature of this draw was that candidates having a low score of 288 received the invitation to apply for Canadian immigration. In the Federal Skilled Trades section of this draw, 500 candidates received the invitation to apply and the candidate with the lowest-ranked scored only 288 points. In The PNP part of this draw 200 candidates received the invitation with a minimum score of 902 points. Such Candidates score 600 points beyond their Express Entry score. 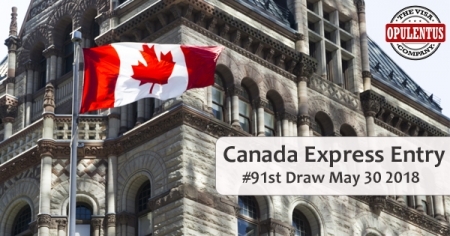 This was the 11th round of invitations of Express Entry in the year and the 91st overall. Additionally this was the third program-specific draw since the commencement of Express Entry. Presently the Immigration authorities can set a number for issuing invitations. When the number of candidates having the lowest score exceeds the number of invitations allowed, they use the tie-breaking mechanism for issuing invitations depending on the time and stamp of arriving. In case than one candidate has this lowest score, the cut-off is determined on the date and time of submission of the Express Entry profile. The top figure in issuing the invitation in a single draw is 3,500. This Change allows the immigration officials to have a great control in implementing a refined method to choose an exact number of candidates to get the ITA. In The past this was not possible. Even in the recent draw the trend was a low CRS score that is below 500. Express Entry is the modern immigration system of Canadian immigration authorities which started on January 1, 2015. It manages applications of skilled worker through Federal Economic programs like the Skilled Trades Program, the Federal Skilled Worker Program, and the Canada Experience Class apart from the Provincial Nomination Programs. Experts estimate seeing nearly 30 draws where 70,000 candidates will receive invitations in the current year. Majority of these draws will feature CRS scores that is lower than 450. This will help the Canadian authorities can meet the target of annual immigration in 2018. Employers must obtain an LMIA or PNP nomination for ensuring long term retention of employees. The aspiring Candidates will require a CRS score that is lower than 450 points. This will help many applicants to get permanent admission without a job offer /nomination under a PNP Getting an approved offer of employment is good for them.